Here’s a attractive clone of the Victoria Bamboo Mod by JAVapes. The Bamboo Mod has a unique ribbed 18650 design that resembles a bamboo stalk with a stylish, engraved logo on the base. It’s offered in several different finishes and includes 510 connection with copper contacts, adjustable pins to prevent battery rattle, smooth magnetic bottom firing button and short thread (1/2 turn) locking ring. 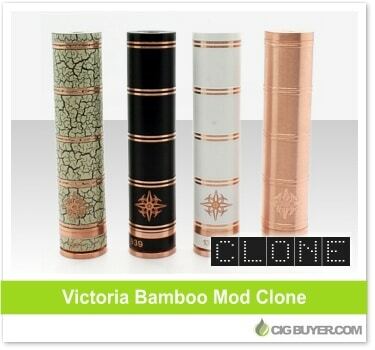 An authentic Victoria Bamboo Mod will set you back $200 or more, but Bamboo Mod clones are available for only a fraction of the cost. Angel Cigs (USA) has several different versions for just $13.99, but inventory is running low. You can also give 3AVape in China a try, with black, copper and white available for $17.90.